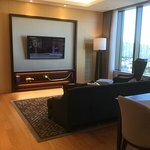 Merci beaucoup de partager votre retour d'expérience sur TripAdvisor, après votre séjour au Grand Mercure Ambassador Seoul Yongsan. C'est vraiment très encourageant de lire que tout était parfait. De la décoration, au personnel efficace, jusqu'au spa, en terminant par le petit-déjeuner hyper complet, vos commentaires vont nous motiver à continuer de fournir le meilleur, pour satisfaire toujours plus, les attentes de nos clients. Encore, nous vous remercions chaleureusement, et nous vous attendons avec plaisir pour un prochain ''excellent'' séjour avec nous ! Thank you so much for your kind and heartwarming valuable feedback after staying at our property. AccorHotels’ luxury serviced residence brand Grand Mercure opens its first door in Korea as flagship. Located in the heart of Seoul—where old palaces and skyscrapers make up a striking cityscape together—Grand Mercure Ambassador Seoul Yongsan is a high-end hotel where tradition harmoniously blends into modernity. Guests can feel rich narratives embedded in high-quality service and amenities, rooted in magnificent heritage of Korea. In terms of TV channel, we have France 24 channel instead of TV 5 and your comment has been recorded for better improvement in our priority database. I really do hope that we will get the chance to meet your expectations once again the near future. Premier séjour dans cet hôtel, habituez aux centre ville et Grand hôtel de Séoul, celui ci se place numéro 1 point de vue qualité prix ! Un accueil, un service personnel au top du top, d'une gentillesse sans mesures! Nous y reviendrons sans aucun doutes à mon prochains passages à Séoul! Nous avons trouvé notre pied à terre à Séoul!! Thank you so much for your heartwarming feedback after staying at Grand Mercure Ambassador Seoul Yongsan. AccorHotels is a world-leading travel & lifestyle group, offering unique experiences through more than 4,000 hotels, resorts and residences in 95 countries around the globe. AccorHotels’ luxury serviced residence brand Grand Mercure opens its first doors in Korea, in the very heart of Seoul—where old palaces and skyscrapers make up a striking cityscape together. Experience first-class hospitality at Grand Mercure Ambassador Seoul Yongsan. And I am extremely proud of our heartists and it is always motivating to receive such kind comments as yours, especially from the phrase, ‘personal service at the top of the top (un service personnel au top du top)’ and ‘home away from home (notre pied à terre à Séoul)’. One of the lovely things about Grand Mercure Ambassador Seoul Yongsan is seeing guests return time and with any future plans to visit Seoul or any inquiries, please feel free to contact us at any time.